Venus follows little sis to the Madrid exits and is no doubt just counting the hours till the grass season starts and her usual triumph at SW19. Who plays on clay anyway? Well Maria Sharapova soon will and it’ll be a very welcome return. Next week in Warsaw (on clay) the former number one and really only true competition to “the real number one” and first round Madrid loser Serena Williams, will finally get on court. Now while the press will probably fuss over what she wears – and she’s had many months now to choose an outfit – and who’s in her box, but all we really care about is how her game is. With a dodgy shoulder hopefully healed and her “cow on ice” attitude towards clay no one can expect too much, but this is Maria Sharapova so no doubt we will expect everything and be disappointed if she’s not a loud grunting, awesome ball thumping machine that demolishes everything in her path. Welcome back Maria. In Madrid Wozniacki won, Hantuchova’s out, Chardy won, Verdasco won, Davydenko won, Tsonga atones for putting out Safin by promptly following, Blake won, Murray surprised everyone and Fed cruised. 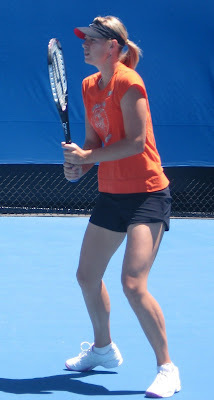 Vera Zvonareva now probably out for The Championships as well as the French Open.